Couch shopping in New York is not as simple as one may think. The furniture has to be petite enough not to overpower a small space, fit through the doorway, and make it around the sharp walk-up turns (remember the “pivot” scene from Friends?). 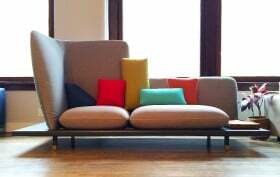 And with those challenges in mind, Berto and Design-Apart brought together 11 New York-based designers and Italian designer Luca Nichetto to crowd-craft the ideal sofa for Manhattanites. Design-Apart produced one of the three designs from the workshop. Called #sofa4manhattan, the selected concept is a contemporary work that unites a number of different pieces.